The annual Exhibitor Party kicks off the weeklong trade show at World Dairy Expo. Hoard’s Dairyman and World Dairy Expo threw a great Trade Show Exhibitor Party on Tuesday night to kick-off the show. Guests enjoyed hot appetizers from three meal stations. A special item on the food table this year was cheese made from the milk of our Guernsey cows at the Hoard’s Dairyman Farm in Fort Atkinson, Wis. The Hoard’s Dairyman Farm ‘Belaire’ is a Port Salut-style cheese, similar to Muenster. It will be available throughout the Midwest in specialty shops and coffee houses. Details are available on the hoardscreamery.com website. Throughout the evening, exhibitors could socialize with each other and share the World Dairy Expo excitement. 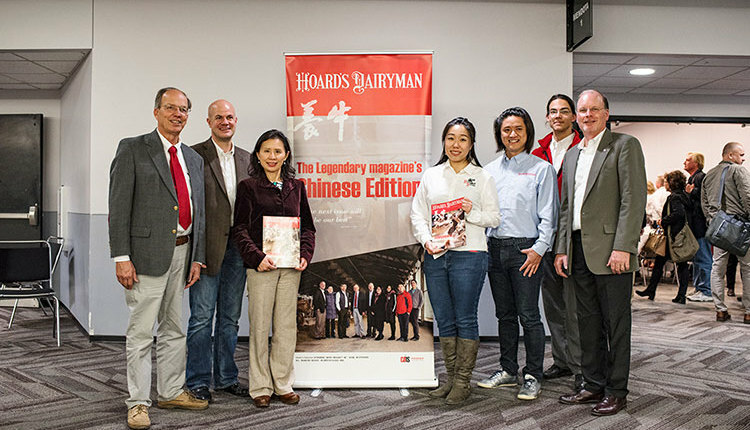 Tables contained fortune cookies to commemorate the launch of Hoard’s Dairyman China, a new publication that debuted last month to reach the Asian dairy industry market. 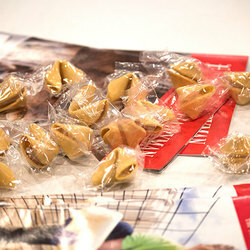 The fortune cookies contained some entertaining quotes, while a few cookies earned the recipient free Hoard’s Dairyman Farm Creamery cheese. 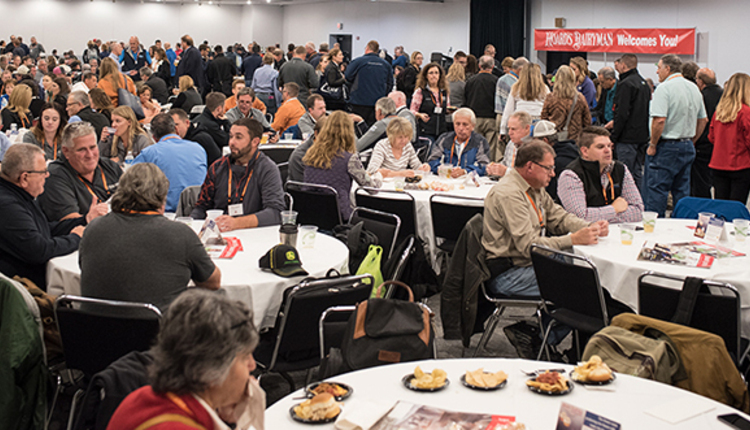 The room was filled with non-stop conversation except for a few comments made by the World Dairy Expo Commercial Exhibitor Committee Chairman, Dean Hermsdorf. The Expo team lost a valuable member, Kayla Sonnenburg, who was the sponsorship manager, earlier this summer. She passed away after a multi-year battle with cancer. The Kayla Sonnenburg Memorial Award will be presented annually to an exhibitor who embodies Kayla’s work ethic, positivity, and eagerness to help others. The first recipient was Austin Turner of Turner Inc. and he accepted the award along with a custom embroidered jacket. Additionally, a bench bearing Kayla’s name is found next to the granite statute of Miss Madison at the entrance to the cattle barns.